August 2017 – AMS Inc.
“The Singing Nations” group led by accordionist Oleksandr Radchenko. Participants and friends of the Auckland Multicultural Society were welcomed by the President, Mr Thuten Kesang QSM at the Mt Eden Memorial Hall as people of many cultures came together to share on 6th August an afternoon of information stalls, dance, music and traditional games and toys event. dramatic spectacle, when “The Singing Nations” group and other performers gathered on stage to sing the National Anthem in Maori and English to open the Expo 2017 event. With the mood set for an enjoyable afternoon of entertainment, a well-designed programme of items unfolded. Credit for the organisation of this event must go to the Society’s events co-ordinator, Mrs Ana Maria de Vos Sanchez, QSM, who devoted many hours contacting performing groups and confirming their participation. Assisting Thuten as master of ceremonies was Sakayan Sitsabesan. 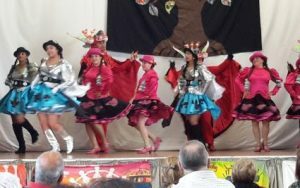 The first performing group called “Renacer en Auckland Chilean Dancing Ballet” roused the audience with its two items dancing “Danza de los Diablos” (in English Dance of the Devils).The first group wearing striking pink blouses and skirts. In the second item, female dancers wearing short swirling blue skirts in front of three men wearing extraordinary devils head masks. They set a very high standard for the stage acts to follow. 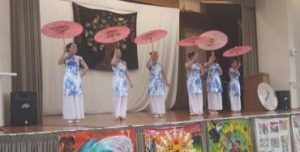 In complete contrast, the Auckland Korean community presented dancers in long skirts waving fans with a striking symbol of Korea. The lively confident Spanish Fiesta dancers made a welcome return with their shoe-stamping dance routine. After a member explained that castanets are a favourite instrument for young children and experienced adult dancers, their presentation was strongly applauded. The graceful Joy International folk dancers from both Taiwan and China danced on stage in superbly costumed silk gowns in vibrant orange, merging smoothly into brilliantly sunny saffron yellow. A few adults from the Chilean community helped Ana Maria demonstrating skills they gained in childhood with spinning tops. Emboques and Trompos traditional games from Chile. These activities with toys and games continued during short interludes throughout the afternoon. 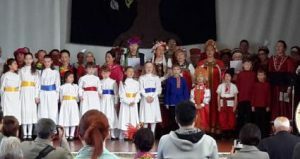 Ukrainian and Russian performers, the “Singing Nations” presented highly enjoyable East European folk songs, led by vocalist and piano accordionist Oleksandr Radchenko. The large group maintained cultural traditions by including children. A young boy Ravil, in traditional blue shirt and black pants sang with an even younger girl, Evelina, beautifully dressed in the front row. Gracefully manipulated pink umbrellas and wearing blue silk costumes the Colour China dance troupe was another winner on the day. A talented group of Spanish dancers called the Flamenco Tierra y Mar Nuevo made a big impression with their passionate dance movements. The appearance of attractively costumed belly dancers from the Volga troupe set the scene for two highly enjoyable items. They were apparently greatly appreciated by some of the young men in the audience who whistled andcheered. To show that men can perform just as well as the belly dancers, two young Tamils, Sahayan and Sayan danced brilliantly synchronising arms, hands, bodies and stamping feet as New Zealand Sri Lankan Tamils. The ever popular Elektra belly dancers of the ABBRACIA School of Dance wowed the audience demonstrating their sinuous movements typical of different Middle Eastern countries, especially Egypt. Nothing could have been more culturally different than the graceful French provincial performers, La Burree. Wearing traditional dresses in full length conservative light blue and grey fabric, they stepped demurely around the stage to traditional French folk music in perfect harmony. Felicity Multicultural dancing followed, demonstrating how people of varied cultural groups can work, relax and play together. Guitarists Richard and Sandy from Devonport showed their exciting musical skills as the Duo Flamenco performers. Presenting music and dances from Iran, the Sunshine Iranian dancers led by Morghan were strongly applauded. They were followed by the very impressive Bulgarian Roses singers and dancers, with some members rushing from the cafeteria where they had been selling tasty Bulgarian savouries and sweets adjacent to the hall. Other food stalls were just as popular, run by the Middle Eastern Iranian community and the South American Mano Amiga (Helping Hand). 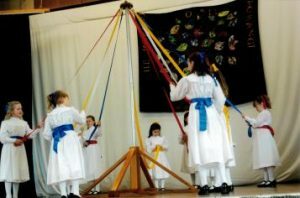 The popular English Maypole dancers from Meadowbank School. expressive dance. Another highlight of the Expo programme was the appearance of the Romanian Folk Dance Group, demonstrating sure-footed movement. Some of the children’s faces painted by Rainbow Rascals artist, sponsored by the Mercury NZ Ltd.
To bring the stage show to a successful conclusion, dance exponent, Ana Maria De Vos Sanchez Director – Folklore Chileno Latino led the dance team on to the stage for a rousing conclusion with the audience encouraged to join in to share their enjoyment of this popular annual festival of music, dance and informative visual display stalls around the hall. 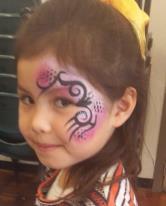 Auckland Multicultural Society Inc. work. The Society has its own website, by Googling Auckland Multicultural Society Inc. for a colourful record of its past and future activities. Information is provided on how to join the Society and become members. Other display stalls at Expo included ALAC, (Auckland Latin American Community), Csardas Hungaria, Folklore Chileno Latino, the National Council of Women, the New Zealand Asia Association, Pan Pacific Women Watch and Mystic Beginnings. Other stalls included Tibetan, Iranian, Japanese, Korean, Russian and Ukrainian cultures, all with attractive and informative displays. At the conclusion of the Expo, Mr Thuten Kesang praised all who had participated and thanked them for making this event so successful. Thanks were also expressed to COGS (Community Organisation Grants Scheme) and Mercury for their sterling support. 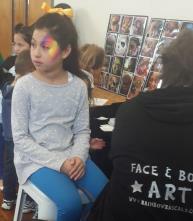 They organised stalls for children featuring face painting and popular give-away twisted balloons in animal shapes, both organised by the Society’s volunteer event Co-ordinator and new appointed AMS Inc. secretary, Ana Maria de Vos Sanchez. for an award by Her Majesty the Queen. After having served 23 years as secretary and co-ordinator of events presented by the Auckland Multicultural Society, I was able to pass my role as events organiser to Ana Maria, who also took on the Treasurer’s role for the past 12 years. She showed dedication, integrity and passion for her multiple community roles. Ana Maria applied a number of skills to her work in the Auckland Multicultural Society, co-ordinating a range of events such as exhibitions, stage performances and festivals. 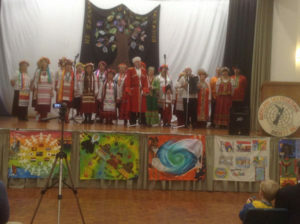 The annual Multicultural Expo in Auckland and the popular North Shore Multicultural Lakeside Festival event, now in its 20th year, have become highlights of her work. She has contributed in many other ways. She served for 11 years as Coordinator for Citizen Advocacy Auckland Inc. and 12 years teaching basic English skills to immigrants and refugees. To enhance her range of abilities, Ana Maria de Vos Sanchez gained a graduate Diploma in Teaching People with Disabilities at the Auckland College of Education Centre for Special Education in 2000 and three years later she graduated with a bachelor degree in Social Sciences. So comprehensive has been her involvement in meeting the health and emotional needs of children and adults, some of her colleagues and friends have described her as “The Mother Theresa of Auckland”. I believe sincerely that Ana Maria de Vos Sanchez deserves recognition with a Royal Honour. She is a model for other migrants to New Zealand seeking to establish themselves as worthy citizens of this nation. For services to ethnic communities. Mrs de Vos Sanchez has coordinated a range of events such as exhibitions, stage performances, festivals, the annual Multicultural Expo, and the North Shore Lakeside Multicultural Festival which is now in its 20th year. As an exponent of Latin American dance she has been a teacher and performer of Flamenco – Spanish dance, Chilean Folk dance, and has supported the Auckland Dutch dancers. She has served as Vice President and coordinator for performing dance groups for the Viva Eclectika challenge competitions. She taught Basic English skills to immigrants and refugees for 12 years. She has supported Mano Amiga (Helping hand), a group of South American women supporting Latin American families in New Zealand. She served for 11 years as coordinator for Citizen Advocacy Auckland Incorporated and has delivered presentations at conferences in Australia and nationally. She has supported victims of domestic violence through Shakti Asian Women’s Centre in Auckland. She has represented the Auckland Branch of National Council of Women on the Auckland Council “Ending domestic violence in Auckland”. Mrs de Vos Sanchez was on the Executive Committee of the Music Association of Auckland from 2006 to 2010. Ana Maria de Vos Sanchez is the first Latin American Justice of the Peace in New Zealand. This book production with its attractive cover and the bold word TIBET in snow-white lettering against the distant slopes of the Tibetan mountains immediately catches the eye. The stark rocky plateau in the foreground stretching into the distant blue Himalayas appears as desolate as the surface of the moon. Tibet was the home of New Zealand’s first Tibetan refugee, Thuten Kesang. One wonders how six 6 million of his people could survive in such a forbidding environment, but Thuten’s vivid description of his homeland and his family living near the capital city Lhasa makes compelling reading. The boundaries of Tibet in relation to Nepal, India, Bangladesh, Burma (now Myanmar) with several great Asian rivers traversing the landscape, show Tibet as a distinct entity and not a province of China to the north as it appears in some atlases. This historical map of Thuten’s Tibetan homeland also marks the route his father and him took to India in 1954 when his father brought him to India for his education, during the oppressive occupation of his once-free land. He finally reached the Indian hill station of Kalimpong to start a new life, but he has never faltered in his quest to restore the unique identity and freedom of his homeland. Later, in 1988, as shown on the map, Thuten and his wife Gwen decided to risk visiting his homeland. They set off from the Nepalese capital Kathmandu travelling overland to Lhasa. Thuten’s autobiography faithfully traces the story of his life from his boyhood years until today as a Tibetan New Zealander. He has made his mark as a leader in the multicultural community, serving as the official NZ representative of His Holiness, the Dalai Lama. Thuten was the recipient of a significant and well deserved Queen’s Service Medal by Her Majesty Queen Elizabeth II. Thuten considered it was an honour to have the book written by him to be forwarded by His Holiness the Dalai Lama. In providing reasons for writing his story, Thuten followed the advice of His Holiness to record for future generations of families what life was like before and during the Chinese military occupation of their homeland. As Thuten describes his upbringing as a novice monk and as a young boy living in the city of Lhasa, there are constant glimpses of life in traditional monasteries and the impressive Potala, built in the 17th Century as the home of successive Dalai Lamas. A remarkable feature of this book is the range of photographs, paintings, sketches and illustrations included in the layout of the book. These provide a fascinating record of Thuten’s years in Tibet, India and his acceptance as a refugee in New Zealand. His philosophy of humility, compassion and empathy for people of other cultures are reflections of his Buddhist upbringing, merging with Christian beliefs as he joined the YMCA in Auckland and marriage to his much loved wife Gwen. Society of New Zealand, Friends of Tibet (NZ), the Auckland Multicultural Society Inc., the Liaison Office of Tibet New Zealand as well as the Tibetan community at large. Thuten’s book provides personal examples from his own experiences of the advantages of becoming involved with other Kiwis and integrating into New Zealand society. His approach to this is a model for other refugees and immigrants to become actively involved in daily work and leisure activities alongside other New Zealanders looking for a place in the sun as well as retaining their own cultures, language and values. For these reasons alone, this book deserves to be used in teachers’ colleges, polytechnic institutes, universities and secondary schools by students, lecturing staff, teachers and students. John Buckland MA Dip Tchg., QSM Principal Lecturer Social Sciences (Retired) Auckland College of Education.